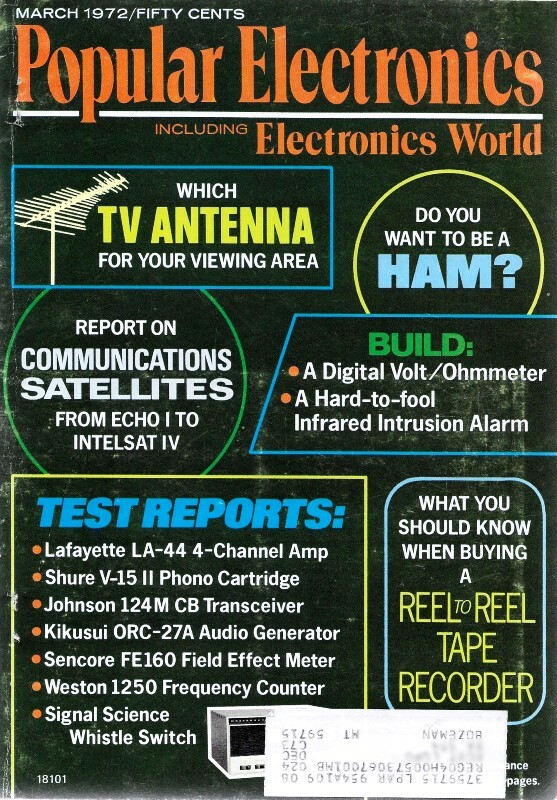 Author Len Buckwalter states in this 1972 article from Popular Electronics that at the time, radio channels were so crowded in California that police were using spectrum in the television broadcast band for communication. The FCC was denying recreational boaters channel space on favor of commercial operators. The problem could not be blamed in available frequency space, but rather on the lack of inexpensive electronic components that worked above a kHz or so. Nowadays when you read in the news about such desperate need of spectrum that network owners pay millions or billions of dollars for a few measly MHz of bandwidth, the cause is truly an overabundance of devices vying for space. Although truthfully, you could claim that exactly the same scenario is playing out today while semiconductor companies strive to bring low cost components in the millimeterwave bands above 30 GHz. Whether you are a ham operator, telephone dialer, airline pilot, police dispatcher, computer operator, shortwave listener, or anyone who wants to exchange information by wire or radio, you're aware of a world in the midst of a communications explosion. Phone circuits are often clogged, radio frequencies are so congested that police in California speak over TV channels, and boat owners are forced to abandon some of their bands to commercial mariners. A million CB'ers seek more channels for personal talk and air traffic controllers urgently need data links to keep aircraft safely apart. Long-range planners insist that these distressing symptoms only hint of what's to come. By the end of this decade, they see a whopping 500 percent increase in global communications. They predict the sound of human voices on phone lines will soon be exceeded by the chatter of machines conversing with each other. And the intense pressure to communicate can only increase as developing nations emerge, or as new electronic services are brought into the home. But thanks to the communications satellite, there should be more room for everyone. Today, a single space vehicle can carry more traffic than all the transatlantic undersea cables combined. Merely three satellites deployed about the earth can "see" every point on the globe, and join any two of them as no cable can. Besides international coverage, a rising generation of "domestic" satellites is filling in sparsely populated regions. This is about to happen in the northern wilderness where cables are costly to lay. Canada has agreed to pay the U. S. $30 million for launching three satellites in 1972, with a similar system planned for Alaska. These developments make it nearly incomprehensible that the first commercial communications satellite thundered off Cape Kennedy only seven short years ago. Marconi, on the other hand, had captured signals across the Atlantic on a kite, a 600-foot aerial, coils, capacitors, an earphone and an inefficient detector. He had unwittingly used nature's communications satellite, the ionosphere. This well-known electrical mirror hovers near the top of the atmosphere where it intercepts radio signals from the earth. If angles are correct, the signals are reflected downward and return to the surface at some distant point. The phenomenon is curiously reminiscent of the first generation of crude, passive communications satellites. Intelsat IV satellite is shown here being tested in the Hughes RF laboratory. Besides achieving great distance, Marconi had produced a second miracle: tremendous increase in bandwidth, a precious commodity in any communications medium. His experiments soon led to the opening of a broad path for global communications and international broadcasting between 3 and 30 MHz. This is the high-frequency band (HF) where the ionospheric "skip" effect is most efficient. If a single voice message requires a total bandwidth of 4 kHz, then consider that the entire shortwave region from 3 to 30 MHz will accommodate only about 7,000 messages. As any ham or SWL knows, the actual capacity is much smaller because of fading, noise, solar flares, radio blackouts and other caprices of the ionosphere. 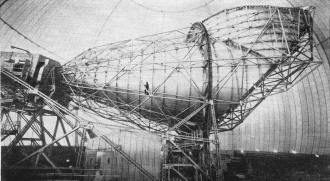 Nevertheless it provided the most important transmission medium for the first half-century of global communications. Today the ionosphere groans from overload. The ham who chases DX fights through unbelievable interference; CB'ers suffer from the howl of heterodynes from local and distant stations; and nations enter delicate negotiations to parcel out precious frequencies. And the pressure increases as the nature of our communications demands greater bandwidth than ever. A TV channel, for example, consumes a 6-MHz slice of the spectrum. This alone gobbles up about 1500 voice circuits and makes international TV a technical impracticality between 3 and 30 MHz. Passive Reflectors. The first signs of relief appeared in 1946. Like Marconi forty-five years earlier, experimenters wanted to exploit a natural reflector, only now it was the moon. It was known that if a signal were high enough in frequency, it would pass through the ionosphere in a straight line and be lost in space. Why not, went the theory, use the moon as a passive reflector to return the signal? The U.S. Army Signal Corps did just that when it swung a radar antenna toward the lunar surface and fired a pulse of microwave energy. Slightly more than two seconds later a weak, noisy signal returned and was heard in the receiver. It was powerful evidence of the feasibility of a true communications satellite. Suddenly an idea suggested a year earlier (1945) by a British science writer no longer smacked of science fiction. 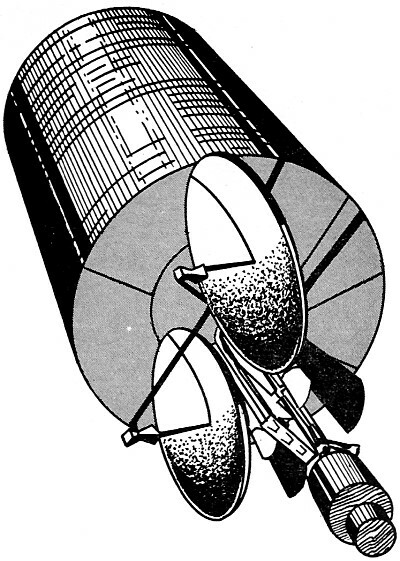 Arthur C. Clarke (who wrote the film "2001"), and others before him, had dreamed up a novel concept of artificial satellites orbiting the earth to serve as radio relay stations. He calculated that a satellite circling at a height of some 22,000 miles would seem to be fixed over a spot on the earth's surface. At this altitude the satellite would take 24 hours to revolve once around the planet. Since the earth also takes this time for one rotation, the satellite would appear to remain in one position. This could provide an unrivalled platform for retransmitting radio signals over the horizon. Clarke's predictions proved surprisingly accurate. By 1958 the U. S. Air Force launched the first true communications satellite. Named Score, it was primitive by today's standards, its payload little more than a tape recorder playing a Christmas greeting back to earth from orbit. (President Eisenhower had pr-recorded the message on the ground.) The conventional batteries that powered the satellite went dead in 12 days. (Today the power lasts seven years.) 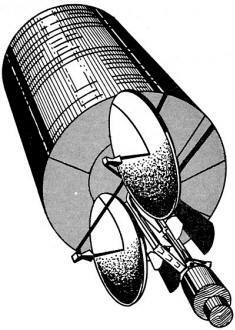 But Score was hailed as the first "active" satellite because it didn't passively bounce back signals to earth but contained active, powered circuits. The big 380-ton horn antenna at the earth station at Andover, Maine, is used by Comsat to transmit and receive satellite signals between U.S. and Europe. The heyday of the passive reflector came in 1959 when Bell Telephone Labs in New Jersey communicated with colleagues in California during Project Moonbounce (again using the moon.) This soon led to a manmade reflector called Echo. Launched into orbit as a tiny packet, Echo reacted to the sun's rays by expanding into a 100-ft balloon with an aluminum foil skin. This created a metal surface orbiting 1000 miles aloft. Although it became wrinkled and deflated after three years, Echo was used to refine the technology needed in the ground stations. During this period, engineers developed horn-reflector antennas of great gain and directionality, extremely low-noise receivers and new tracking techniques by computer. The passive reflector idea, though, was short-lived. A far more sophisticated package roared off the pad in 1960. Called Courier I-B, it was studded with 20,000 solar cells and could sustain itself by converting the sun's energy into electricity. Equipped with four receivers, four transmitters and five tape recorders it demonstrated the possibility of storing received signals on tape, then re-transmitting them at a later time. This was the solution to the problem of linking two ground points that could not "see" the satellite at the same time. Technical difficulties brought Courier to a premature end after 18 days, but not until it had received and transmitted 118 million words. Telstar and Later. Courier stirred great scientific interest but it only hinted of things to come. A series of sensational successes followed in the summer of 1962. Just before daybreak on a July morning a Thor-Delta rocket lifted off Cape Kennedy. Minutes later Telstar I, a 3-foot-wide craft was inserted into an orbit that ranged between 600 and 3,500 miles. 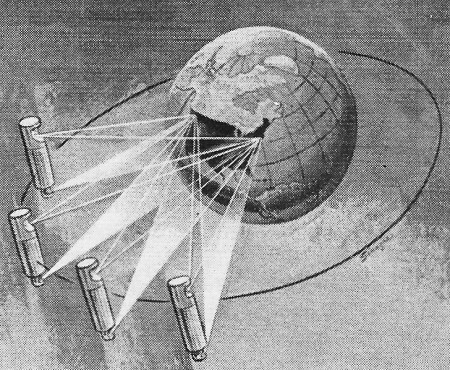 During the sixth pass, Telstar relayed the first live TV program between U.S.A. and Europe. 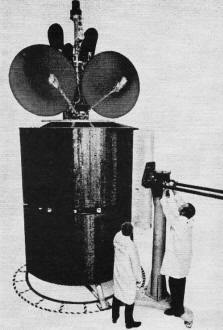 It did it with no time delay or tape storage: Telstar received and transmitted simultaneously. Below the TV picture of singer Yves Montand appeared the sub-title on American home TV sets "Live From France." Despite its dazzling success, the vehicle fell victim to the hostile environment of space. Two months after launch, engineers noted the vehicle was not executing the "T2" command, an order to turn off communications equipment when out of range. Otherwise there would be a serious drain on the electrical system. Some electronic detective work revealed the culprit. Sensing devices on Telstar reported the space vehicle had picked up 100 times more radiation than predicted as it skirted the Van Allen Belt (which girdles the earth with high-energy electrons.) Acting on this cue, engineers doused similar Telstar components in the lab with heavy radiation. They discovered that radiation could penetrate transistor casings and ionize the gas trapped within. Since gas ions are electrically charged, they interfered with normal transistor action. Telstar I fell silent six months after launch. Four domestic satellites proposed by Bell System would provide 83,000 channels for voice, 24 TV, and 64 spares. These findings protected Telstar II against similar misfortune. A new orbit swung the vehicle 3000 miles further into space and held it beyond strong radiation belts for longer periods. What's more, the troublesome gasses inside the transistors were carefully evacuated during manufacture. The stage was now set for the first practical, work-a-day communications satellite. Much had been learned through experiments on these early "low-orbit" vehicles which swept over the earth to link two points on the earth's surface only hours at a time. Now the time had come for a satellite system that could provide continuous commercial service. It happened April 6, 1965, as Early Bird (Intelsat I) rose to its perch 22,300 miles above the Atlantic. Small by today's standards (it weighed 8.5 lb. ), it had a capacity of 240 telephone circuits. But in a single leap it increased the transatlantic cable capacity by 50 percent! It also turned in a remarkable record of 100 percent reliability in 3 1/2 years of service. Just as Clarke predicted back in 1945, Early Bird and the "synchronous" satellites which followed give the illusion of standing still. Their velocity through space is about 7000 mph, as the earth's surface below moves at 1000 mph. The reason for the difference is easily seen by viewing a disc rotating on a phonograph. Although the disc near the spindle seemingly crawls around, the edge of the record moves quickly. Both areas, however, complete one turn in exactly the same time. The satellite's synchronous orbit, which is also described as "geostationary," provides a big advantage in satellite communications. The craft is fixed s that it becomes the equivalent of a permanent tower high above the earth. This is in contrast to earlier satellites which rapidly looped around the globe to provide only fleeting periods of communication. The synchronous craft "transponds" continuously; that is, it receives signals from one earth station and relays them to another station thousands of miles away at the same time. The shortcoming, though, is that a synchronous satellite "sees" only one-third of the earth from its fixed position. This is solved by orbiting three equally spaced satellites for global coverage. Right now there are vehicles hovering above the Atlantic, Pacific and Indian Oceans to enshroud the earth. The synchronous satellites have other shortcomings, too. Remaining parked in orbit is a tricky condition because celestial mechanics are hardly constant. The earth's gravitational pull has irregularities which cause orbital drift. The sun and moon exert pulls which affect the satellite with uneven forces. Even the tiny push of sunlight against a space craft threatens to disrupt its delicate balance. Such factors can wobble the vehicle off course and ultimately spin it to a fiery death in the atmosphere. To see how these problems have been solved, let's examine the techniques used in Intelsat IV, the newest of the communications satellites. The Newest Satellite. 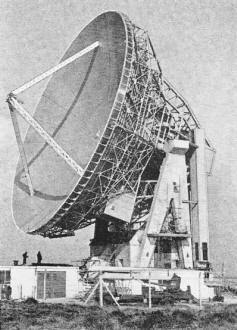 The Intelsat IV was placed into service in March, 1971 over the Atlantic. Any irregular force on the vehicle is countered by pairs of onboard thrusters. Driven by hydrazine, the thrusters are positioned around the vehicle so command signals from earth can accelerate it in any direction. Sufficient propellant (270 lb) is stored to keep the craft on station during a design life of seven years. Next, there's the matter of keeping certain surfaces pointed earthward. This is essential to exploit highly directional antennas which make most efficient use of electrical and radio power. This is done by "Spin-stabilization" to keep the vehicle rotating at 50 rpm. (Thrusters also regulate this action.) Thus the craft achieves rigidity in space from a gyroscopic effect. Not all of the satellite is allowed to spin since those directional antennas must be aimed and held with incredible accuracy. About half the vehicle, the part with the antennas, is "despun," or counter-rotated, to bring it to a halt with relation to earth. A transfer assembly on ball bearings carries power and signals between the rotating halves of the vehicle. This stable arrangement supports a veritable antenna farm. Two high-gain horns receive signals from earth and two transmit them back There are several non-directional antennas to handle the command and telemetry signals which monitor and govern the vehicle's condition, There are also "spot beam" antennas which can be precisely aimed at a small region on the earth for point-to-point traffic. These narrow signals can increase the number of circuits since energy is held within a beam only 4.5 degrees wide. 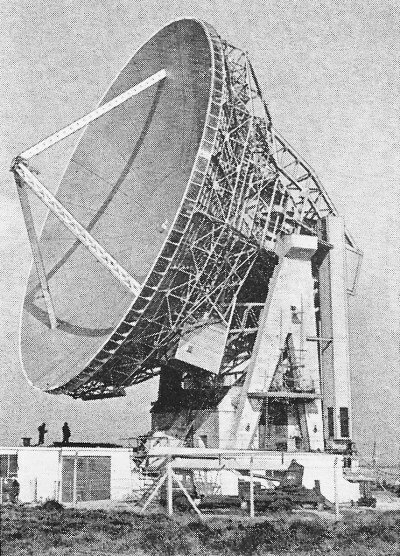 Ground station at Goonhilly Downs in Cornwall, England, uses steerable 85' parabolic dish to transmit, receive. Thanks to high-gain antennas in the satellite, as well as huge horns on the ground, the transmitter power may be only six watts. In a typical transmission, a signal from the ground is sent to the satellite on a frequency of approximately 6 gigahertz (6,000 MHz). This is in the microwave spectrum where waves are extremely short in length and display no bending through the ionosphere. Upon receiving the signal, one of 12 transponders aboard the satellite retransmits the intelligence toward earth on 4 gigahertz (4,000 MHz). By separating arriving and departing signals in frequency, the relay is simultaneous, since the transmitter doesn't block the receiver. Power for the satellite is derived from 40,000 solar cells which spin in the sunlight. They produce about 500 watts of primary electrical power (at 24 volts) to energize transponders and control systems. If a solar eclipse occurs, power is temporarily obtained from two nickel-cadmium batteries held on charge by about 3000 solar cells. The complete, self-sustaining vehicle is about the weight of a Volkswagen. What does it add up to in communications capacity? With its 12 transponders operating, Intelsat IV can provide more than 9,000 two-way telephone circuits (each 4 kHz) or 12 television channels. In typical operation the satellite carries about 5,000 voice channels and TV. Some transponders aboard feed the spot-beam antennas for point-to-point traffic, while other transponders feed the horns which cover the viewable earth disc. Compare Intelsat IV's capacity -a total bandwidth of 432 MHz - with an ionosphere barely 30 MHz wide. And the satellite is virtually immune to the vagaries of sun and static. During 1970, the Intelsat III satellite series carried their traffic without fail during 99.55 percent of the time. Support from the Ground. Orbiting hardware captures the headlines, but it would be so much debris without support from earth stations. To gain access to the system, 30 countries have erected 43 earth stations throughout the world. These figures are expected to double within the next three years as space communications continue to reduce traffic costs. It's notable that countries with traditionally poor communications (Latin America, the Far East, the Near East and Africa) are taking the great leap forward with the construction of their own earth stations to participate in the system. Consider what you'd see at a typical ground facility, like the Bartlett Earth Station recently completed near Anchorage, Alaska. It communicates through Intelsat III positioned over the Pacific to provide a direct tie between Alaska and the lower 48 states or Hawaii, Australia and Japan. The station receives locally generated traffic (telephone, teletypewriter, TV or high-speed data) and sends it through a huge dish-shaped antenna 98 feet in diameter. Although the array weighs 315 tons, it can be rapidly rotated toward the satellite and zeroed on target with an accuracy of 2/100ths of a degree. Signals fly simultaneously to and from the satellite through the same dish, kept apart by a 2-gigahertz frequency difference. To keep ground receivers operating at the greatest possible gain, front-end amplifiers are cooled almost to absolute zero by helium. This slows the molecules in the circuit so they contribute less noise to the faint signals arriving from above. It takes 16 men to run Bartlett around the clock. About 80 percent of the traffic now carried by all satellites is the telephone message. And it's increasing at a rapid pace. The number of phone calls between Argentina and the U.S. jumped from 200 to 400 per day last year when satellite service commenced. TV news pickups and special events via live satellite relay are now routine, and this will surely increase due to major rate reductions. Today's cost for a minute of transatlantic TV is $66 - a mere 15 percent of the tariff back in 1965. Despite the exciting success of the communications satellite, its future sparks plenty of lively controversy. The privately owned Communications Satellite Corp. (Comsat) in the U.S. is attempting to accommodate the differing needs of a common carrier like A.T.&T. and the TV networks. A renewed space race is brewing between three competing international systems: Intelsat, an organization of 79 nations in a joint venture; the Franco-German Symphonie satellite and the Russian Molniya. Technically, some interests are calling for a quick jump to much higher frequencies - as far as 30,000 MHz - where the bandwidth available is even greater. This is opposed by others who feel that the state of the art is still years behind such a plan. They point out that, as the frequencies grow higher, they behave more like light and are attenuated by rain and other obstacles. But it's a healthy battle with little of the wasteful duplication of the first space race.